Summary: Dracaena fragrans corn plant, grown in many forms, usually multiple plants of staggered heights, hardy indoors when acclimated. Fragrans is the solid green variety of Dracaena family we often call the corn plant or cornstalk dracaena. Some of its other common names include mass cane or Massangeana cane.The fragrans flower gave the plant its name from the sweet-smelling fragrant flowers it occasionally produced. The different forms and cultivars such as dracaeana deremensis, dracaena reflexa and dracaena sanderiana make the dracena plant one of the most popular groups of houseplants grown today. They are also among the best of all interior plants. Here is what one interior plant professional said about Dracaena fragrans Massangeana. No one can argue the fact that, once this plant (Dracaena fragrans ‘Massangeana’) is fully acclimated and hardened off, there are few studier choices in its height range, especially for low-light settings. In Europe back in the 1700’s the Dracaena fragrans made its mark as an indoor plant, along with the Kentia palm, cast iron plants (Aspidistra) and what we know as the “boston fern”. 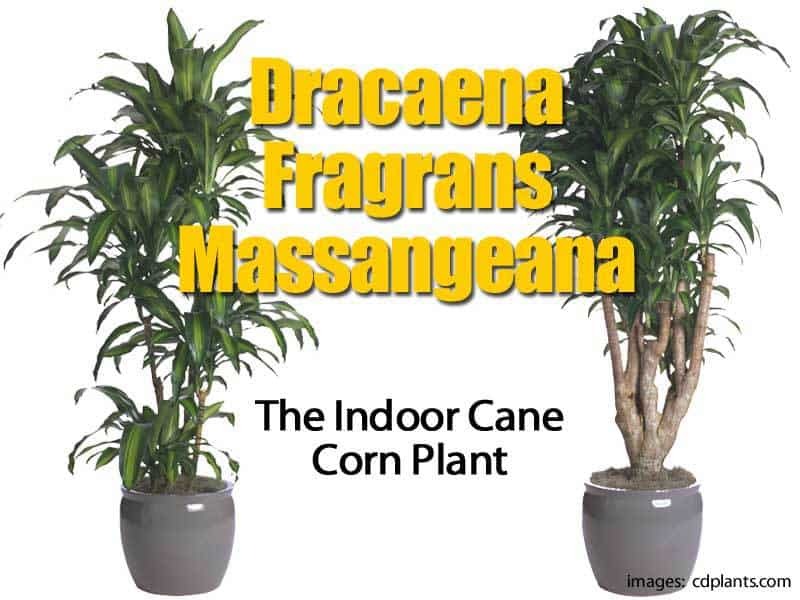 During the early 1900’s Dracaena fragrans made its way onto the plant scene in the United States. One of the most famous dracaena varieties of today is the lucky bamboo (dracaena braunii). They make beautiful indoor houseplants. Dracaena fragrans is native to the African region of Upper Guinea, growing in humid, tropical forests. In its native habitat the plant is frequently, but not always, shaded by surrounding vegetation. Fragrans, the species, is completely green with a non-variegated olive green leaf. Most plantscape professionals and consumers prefer the more colorful variety Dracaena Massangeana as their house plant. Although there are several varieties, the whole group is commonly called the corn plant. The “corn plant” gets its common name from its upright growth and graceful leaves which resemble corn foliage. Dracaena fragrans Massangeana is the most popular variety with broad green leaves and central yellow stripe. Massangeana accounts for most of the corn plant production grown and sold. Most of the potted corn plants found in the local garden center or nursery are sold in bush form or as staggered canes of varying lengths with multiple heads on each cane. Often three or more canes of differing length are planted in a single pot soil. The most popular size produced is a 10 inch pot mix with cane lengths of 4, 3, 2 feet. Growing the dracaena house plant using different cane lengths, with each cane having sprouted a new head or heads of foliage, makes Dracaena fragrans excellent as a tall indoor specimen. Sometimes stock plants are harvested and planted in containers, where they send out multiple heads, for an unusual effect. “Branched cane” are also grown in stock farms in Central America and the Caribbean. These branched canes are then “assembled” to make attractive large-container plants. Dracaena fragrans grows very straight and upright, this gives us a pretty good clue why it is used so much to decorate corners. Coupled with an attractive decorative container makes them an eye-catching duo. Fragrans are also used as tall specimens in landscapes outdoors. In countries with a tropical climate, single-cane pieces of Dracaena fragrans are planted to make living fences. Dracaena fragrans grows very straight and upright, this gives us a pretty good clue why it is used so much to decorate corners. Dracaena plant care greatly involves lighting. Light requirements at an absolute minimum fragrans should receive 75 foot candles for eight to 12 hours per day. Natural light seems to give Massangeana its best color – bringing out the bright yellow striping. Plants will do very well in a north window. It is important during the summer months to watch for plants being exposed to the bright western sunlight. When this happens, leaves can become bleached or burned. If your plant is going to be in any kind of intense light it should be at a minimum, through filtered light. Using a curtain to filter the light works great. Under lower indirect light levels Dracaena Massangeana may lose some of their bright striping. Old plants which have been indoors for a long time look like their striping has faded. Old corn plants in interiors generally develop leaves which are long, stretched, and thin with very little variegation. You can cut corn plants back to any desired height if they become unattractive, and new buds will break. Tip cuttings can generally be rooted easily. Over time indoors the leaves of fragrans will accumulate dust on the upper leaf surfaces – cleaning indoor plants and dusting should be done regularly. When watering Dracanea Massangeana & fragrans make sure the soil is thoroughly soaked and drain off the excess water, which is why it’s important to plant them on a well-drained soil. The soil should stay moderately dry between waterings. Rainwater is excellent! Corn plants do best if relative humidity is 40% or more. I use sub-irrigation for watering my plants indoors or submerge the plant in a 5-gallon bucket until no air bubbles are rising, then drain off all the excess water. Do not over water your fragrans plants to avoid root rot. Fragrans does very well when the temperature is above 55 degrees. Cold injury can occur as temperatures approach the 40’s, especially if it is windy. High temperatures can also contribute to leaf burn. Protect the plants from exposure to wind and cold. In hot weather the leaves of fragrans will twists its leaves sideways in its effort to reduce the leaves exposure to sun. When things “cool down” the leaves return to their normal pattern. Chilling injury can occur somewhere between 35 and 50 degrees It also depends on the amount of wind that comes with the cold. Cold injury will appear as light gray or brown leaf margins. A plant injured from cold does not mean – it will die. Cold damage shows up quickly on fragrans. Do not start trimming leaves right away. Allow the plant to recover first. You may cut off more foliage than necessary or not enough. Let all of the damage show up before you start trimming, this could take as long as two weeks. Indoors, I would generally discourage the use of fertilizer. You’ll hear me say this over and over again. Dracaneas are very sensitive to excess fluoride and boron. They most likely get this “excess” fluoride and boron from fertilizer. The corn plant can burn rather easily when either of these two elements get out of balance. Brown Tips are generally the sign of a fluoride problem! What Does Fluoride Do To Dracaena? Fluoride accumulation prevents proper closing of the stomates (the openings in the leaves which help them “breathe”) and the result – tip burn. Plants growing in the nursery, have stored plenty of nutrients within the cane to sustain the plant for a long time. As a Dracaena acclimates to their new indoor environment, their food requirements are greatly reduced since the metabolism of the plant is slowing down. There are a few other fragrans varieties produced but not in very large numbers. The culture is basically the same although the varieties of Santa Rosa and Lindenii will usually require more light to maintain good color. Basically they are “reverse” Massangeana with less chlorophyll in the leaves. All of the varieties of Dracaena fragrans are wonderful indoor performers and have proven themselves over and over again. There is hardly a home that could not use the true tropical beauty the time tested Dracaena fragrans and/or Massangeana plant.